Designed in Sweden with Swedish weather conditions in mind! 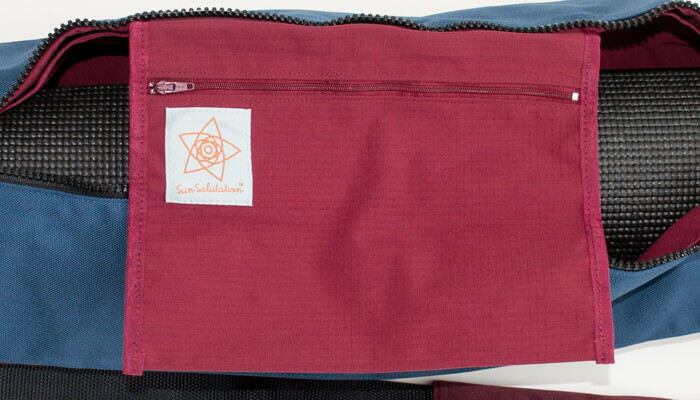 This stylish, durable and lightweight mat bag will fit most yoga mats. 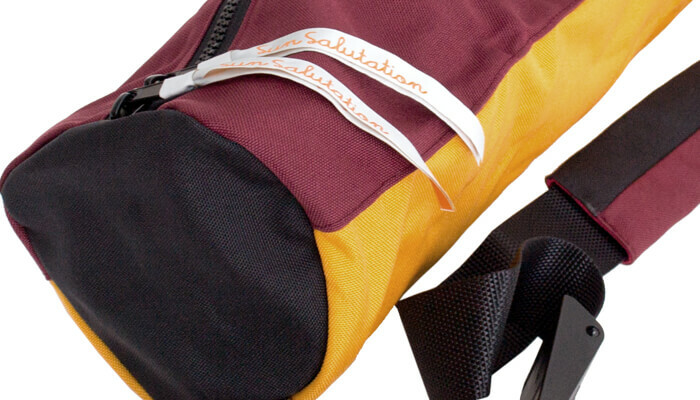 The Sun Salutation Street Bag is made from water resistant high performance 1000d Psittatex and has a woven nylon / ripstop lining. 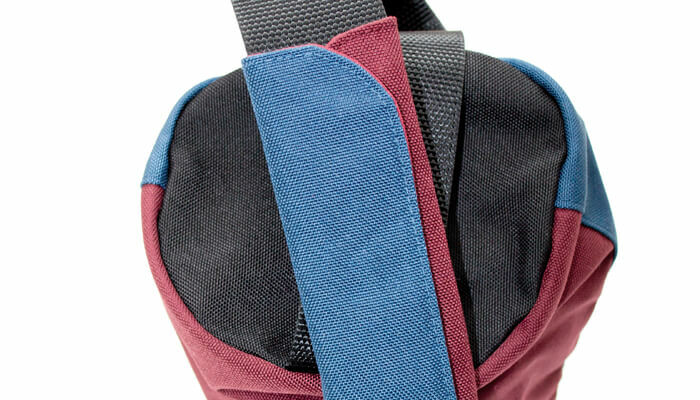 The bag has three internal pockets (one zipped, two open), adjustable strap and a comfortable shoulder pad. 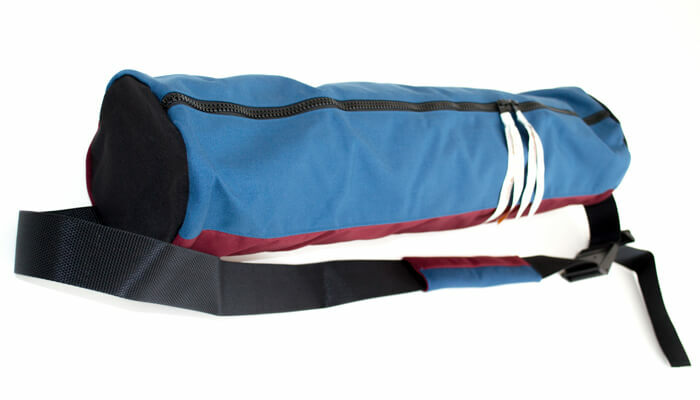 The full length zip has two pulls providing easy access for your yoga mat. 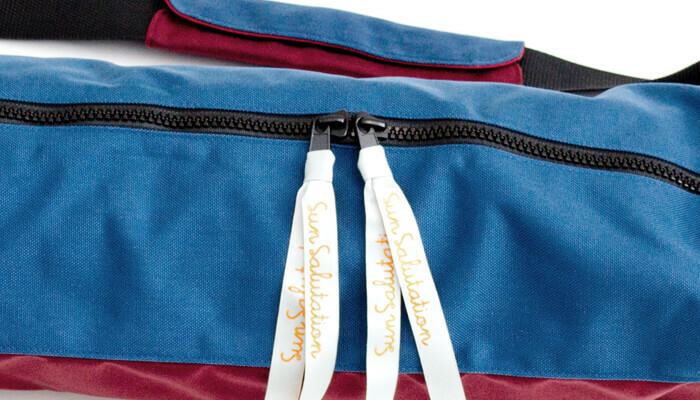 The zips come with Sun Salutaion ties which are removeable if you prefer. Available in 2 great colour combinations. 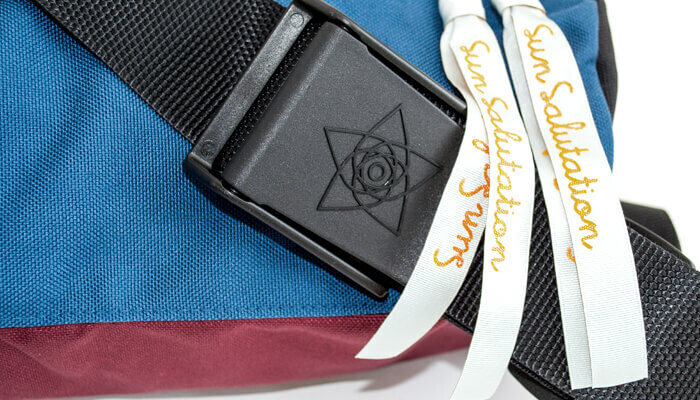 We love the chunky buckle which is designed like an aeroplane seatbelt buckle and features the Sun Salutation logo. We also love the fact that this bag is lightweight and water resistant, meaning it can easily be carried and will cope with the wonderful British weather! The internal pockets are very useful too - one is zipped and roomy, making it ideal for keys or a phone, whilst the others are open and handy for toiletries etc. This bag would also fit both a cotton and sticky mat when rolled together. Great quality product from each stitch to the handles. Looks very smart, it's tough, great functionality - no nonsense having to wrestle with inferior quality zips, etc. Mat fits in fine, bag fabric is tough and is waterproof (as tested cycling in rain this week) - huzzah! Easy to put on and off, only challenge at moment is the strap -buckle is solid, easy clip and slide but the surplus strap then loops out whilst i still have plenty beyond dangling (this may be because i am fairly small or haven't yet mastered the adjustment, however!). Good quality product, good service and delivery. Stylish, waterproof and it's also practical that there's a zip lengthwise to make it easy to get the mat in. The bag is excellent as was the service from Yogabliss, I received the order the next day although I only paid for first class postage. A beautifully made bag - fits my slightly wider than average mat (also from Yogabliss). Comfortable to wear over my shoulder as I cycle. And waterproof - essential for the rainy days. 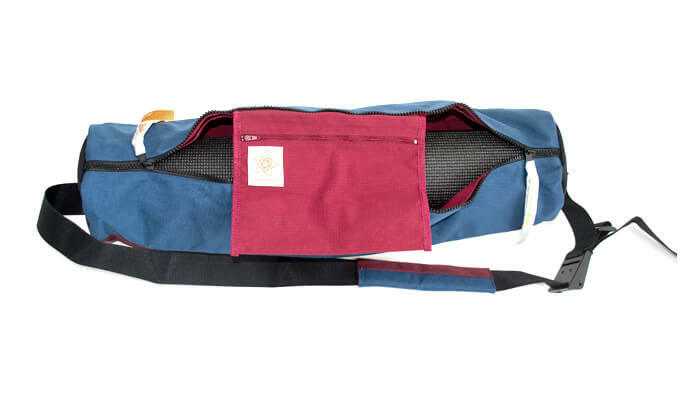 I am very pleased with my bag (maroon/blue) it is roomy and holds my mat plus yoga bits. I cycle to my yoga class and the bag is comfortable to wear. It is strong and hopefully waterproof, although it hasn't been tested yet. Delivery was also quick, within 3 or 4 days. Really pleased with my purchase. Very good make, already tested in the heavy rain and the stuff inside stayed dry. There's just enough space with my classic prolite mat (millenium mat) for a few bits inside, even for a small water bottle. Also very quick delivery! Definitely recommend Yogabliss and this bag. A good quality,strong bag with a comfortable shoulder strap and smart colours. Very useful when you are on the move. After purchasing the "Om" yoga mat bag I was struggling to fit my mat in the bag as the zip was curved and not end to end thus shortening the gap to get the mat in. I explained this to Nicola at yoga bliss who very swiftly sorted refund and advice about this sun salutation bag. I'm very pleased she did because it's perfect. It's a very robust bag and also has a great carry strap. (A little long as previous reviews have said but a bit of Blue Peter magic of a cut and hot flame to seal the end did the job of making it a perfect length). The strap and bag is excellent for going across my back when I'm cycling to yoga and very comfy as a shoulder strap when I walk to yoga. The material is thick and strong and I am sure will be water proof as advertised. Overall perfect for me. Thank you Yoga Bliss and Nicola for your help. I actually hesitated before buying this as the colour I wanted wasn't in stock. But I love this bag (blue/red)! Plenty of room for everything I need to carry with me. No rain since I've been using it, but the material is pretty sturdy so I reckon it'll cope when typical Scottish weather returns! This a very substantial product, no skimping on materials. I have a thick mat and there is still space inside for bits and pieces. Bought as a Christmas pressie for my sister to use on her bike and she is really pleased with it. Thank you so much. I was looking for a nice, sturdy, seriously waterproof bag (because I live on Skye). This fits the bill and looks stylish in a low key way too. It is pricey but shows every sign of being well-made so should last a long time. I carry a Manduka ProLite in it plus occasional extras such as a yoga belt, eye pillow, car keys and travel clock. It would be hard to get a wider mat in it, I think, as the zip is only along the long side (not down the ends as in some bags). The only thing I don't like so much about the bag (hence 4 stars) is the strap, which is enormous - I'm 5ft7ins but still had to shorten it so much there's a long trailing extra bit. It's clearly designed to fit over a huge Swedish guy, including his down parka :-) So that'll be a plus for some of you! Really good quality! Amazing to carry on and amazing service from you guys. At first I ordered another mat bag. But the following the day I had a call from a lovely lady and she asked me if the mat was for my Ashtanga yoga mat which I purchased here too and I'll write a review too. Anyway I said yes it was for that and she kindly told me that wouldn't be good for my mat and suggested this one instead!!! Best service ever!!! Really happy custumer. I have only used it for a week but I'm very happy so far. Great, heavy quality, very spacious and and very comfortable to carry.